I will confess that we don’t drink a lot of riesling in our house. We have plenty of riesling on hand, bottles from Germany, bottles from the US, and even a bottle or two from Australia. It’s just not something we sip often! However, I know there are some amazing German rieslings to be enjoyed, so, when the Wines of GermanyPR team invited me to the Riesling & Co. Road Trip here in West Palm Beach next week, I accepted the invitation. I think the coolest part of the Riesling Road Trip is the truck that brings the wine town to town! 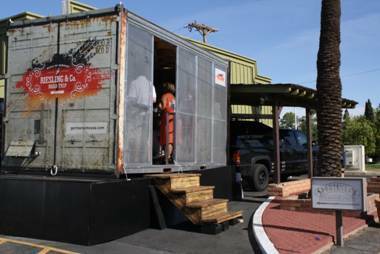 Hello, this is a shipping container that has been converted into a MOBILE WINE BAR! Then, that bad boy make stops at wine shops like Virginia Philip Wine Shop & Academy here in West Palm Beach, bringing the tastes of Riesling, and Germany, to you! It can only get better if it actually came to your house! However, if the cool venue wasn’t enticing enough to get you to come sip some Riesling, the people you’ll meet are great reasons to make it to the next Riesling & Co. pit stop! When you come out to the Riesling & Co events near you, you’re going to get to meet some very interesting people while sipping on Riesling. I am excited to meet Paul Grieco, whose New York City restaurant, Hearth, is currently nominated for a James Beard Award. Paul is joined on the East Coast Riesling tour by Stuart Piggot, who has a book about Riesling coming out in June of this year. And, when you join me in West Palm Beach on May 7th, you’ll probably meet Master Sommelier Virginia Philip, one of only 19 women, and a total of 135 people in North America, to earn the distinction of Master Sommelier. If you’re in South Florida, come to West Palm Beach and learn more about Riesling on May 7th! We can compare and contrast the differences between Rheingau versus Mosel Riesling. Or, we can just sip on the wine and enjoy the South Florida sunshine! On May 7th, Wines of Germany will be teaming up with Virginia Philip Wine Shop & Academy to host a unique wine tasting as part of the Riesling & Co. Road Trip. The tasting will feature a variety of German wines. Ticket information: The event is open to the public. Call (561) 721-6000 for ticket purchase information. You can buy tickets and register online too! Wines of Germany is the first wine board to conduct a multi-city road trip in the U.S., in an effort to bring Riesling to interested consumers, beverage directors and restaurateurs, no matter where they may be located. Does the Riesling Road Trip stop in your home town? Are you going to attend? Let me know!